How did such a wonderfully strange name such as Ant Trip Ceremony come about? The band's name came from Steve DeTray. He entered Oberlin College in Ohio in 1964 but took a hiatus from college in 1966 and part of 1967. He went to stay with his brother in Logan, Utah. There Steve formed a band and needed a name. By chance he mentioned it to an English professor at the nearby University in early 1967. The professor suggested a phrase, "ant trip ceremony", from an American novel whose title Steve can't recall. The author described modern societal life as an ant trip ceremony. Steve thought it spoke to the alienation felt by many of the younger generation in 1967, and the name stuck. 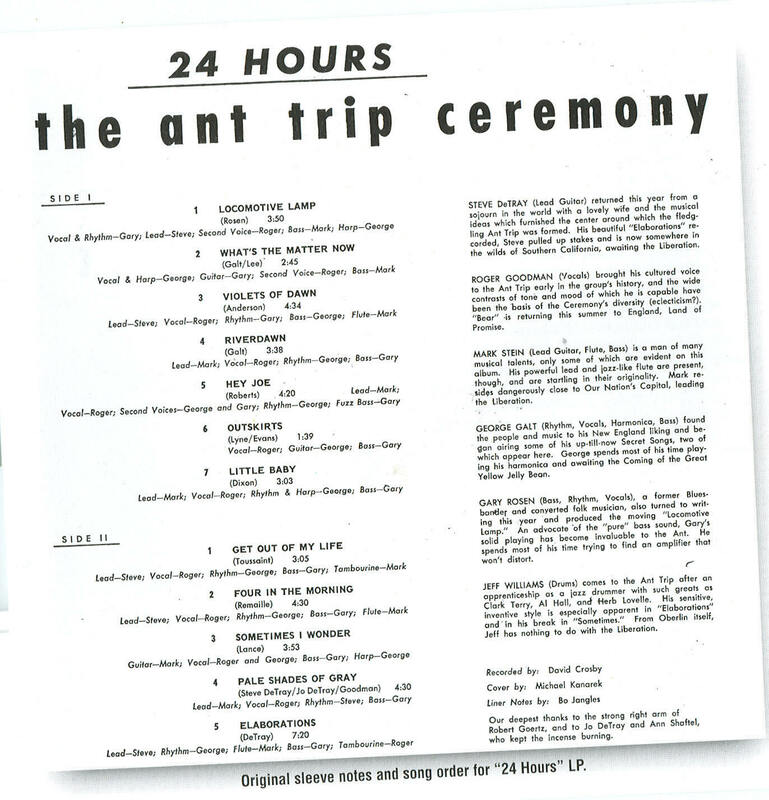 So in essence there were two different groups with the name Ant Trip Ceremony. 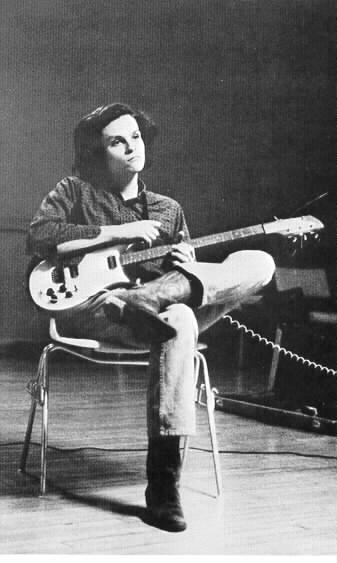 The first one Steve formed in Utah in early 1967 and then the second one which he formed at Oberlin in the fall of 1967. Steve left Utah in the summer of 1967 and headed back for a tour of duty at Oberlin College. The band he had in Utah had broken up and Steve wanted to put together another band at Oberlin. Steve put out the word that he wanted to form an electric rock and roll band. Gary Rosen was playing in a blues band with George Galt and Mark Stein. Stein, a multi-talented instrumentalist, was a flute major at the Oberlin Conservatory. Roger Goodman was a brilliant keyboard player, but refused to play it while in Ant Trip Ceremony and only wanted to sing. All the members for the new band were from Oberlin with the exception of Jeff Williams who was a local sixteen year old up and coming jazz musician. 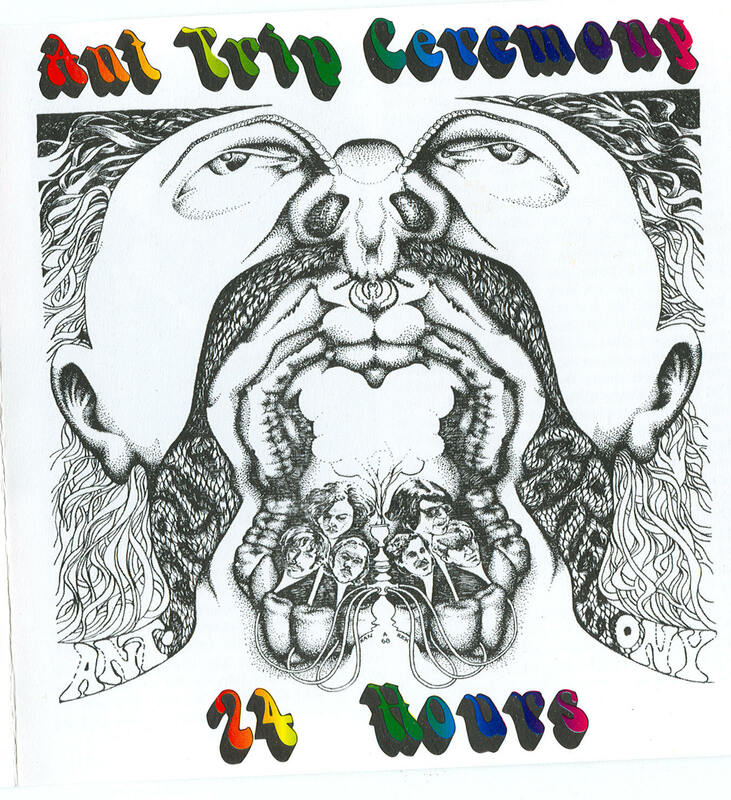 The Ant Trip Ceremony album was recorded during two sessions. 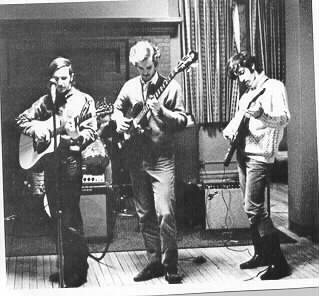 the first session was in February of 1968 in a rented hall at Oberlin. Steve was there for the first sessions but had left Oberlin by the spring of 1968 and was not present for the second recording session. The album was called "Twenty Four Hours"because that was the feeling behind the sessions (ie.that it took what seemed like twenty four hours to record). The machinery used for the recordings was primitive. The band used a KLH tape deck for playback and a two track Roberts reel to reel for recording. When they wanted to multi‑track they would record on one side of the tape and then record on the other side as well. Then they would mix it down to the KLH. The reason the album sounds somewhat imbalanced is because the KLH had one faulty speaker and thus the speaker balance leaned heavily to the left. This ended up affecting the final mix-down. How were the songs chosen for the album? The band felt ready to record their original songs. These were performed live before student audiences. During live shows, the band was wild, but sadly no live tapes exist. Thus the original songs done on the album when performed live were more psychedelic and improvised. Where did the band play live? Mostly at Oberlin and at off campus parties. The band was known for getting into strange and long jams. Furthermore no song was ever done twice exactly the same. They were, in some ways like the Grateful Dead of the region. When the band played it was a happening, a genuine psychedelic event. Shows went on for hours, with the audience in a wide variety of states of consciousness. Three hundred copies of the album were pressed and one hundred were sold for $3.00 each!! The album's expenses was shared equally by the band members. The artwork and production was done at Oberlin for free. Why was the album done? Steve was leaving Oberlin, and the band wanted to capture some of the magic they had collectively created anything could happen in those days, that there were no limits. The producer of the album was David Crosby, an Oberlin student and good friend of the band who was very much into music production and sounds. Sadly, he passed away during the making of this reissue and will be missed greatly. The artwork for the album was of its time with psychedelic‑mind‑zapping art work. It was without a doubt a counterculture statement!! What are the songs about? "Elaborations"‑a great example of Steve's development of the Indian Raga form, with his guitar tuned to get a sitar sound. He had also been to Berkeley in the summer of 1967 and was wowed by bands such as The Grateful Dead, Jefferson Airplane, and Quicksilver. " Pale Shades Of Gray"‑.words were written by Steve's first wife, with some Procol Harum influence, is about the pain of alienation. "River Dawn"‑ George wrote this song about escaping the restrictions of campus life by sitting on the banks of the Ohio River when the sun was coming up. "Locomotive Lamp"- Gary’s first song as a singer-songwriter. It was a forerunner to the Grateful Dead’s train/drug imagery. “Little Baby”‑ a blues cover song that was done by Gary and George's blues band before Ant Trip Ceremony. “ Violets Of Dawn”‑ the band members were fans of Eric Anderson and covered the song, that was also done by the great Northwest group, The Daily Flash. “ Hey Joe”‑ the band loved Jimi Hendrix (of course) and did this cover version in his honor. “Four In The Morning”‑ a weird but strangely ethereal song that bears a striking similarity to “Hey Joe” with its despondency and desperateness. “Outskirts- A song about alienation, has words by Oberlin poet, Sandy Lyne and music by pianist, Neal Evans. “What the matter now”‑ written by George's friend , Jack Lee. Lee used to play with Mother Earth. George got the tune from Jeff and added different words to it. “Get Out Of My Life Woman”-a then popular cover song that west coast bands such as “The Doors” were performing. “What’s The Matter Now”-a lovely psychedelic number that predates the background vocal effect John and Yoko were doing in 1969 and 1970. “Sometimes I Wonder”- no available comments on this blues flavored melody. A special thanks first and foremost to Steve DeTray for the great photos and inside information, George Galt for the time he took to be interviewed for this project and his great wealth of information about the 60's. Gary Rosen for putting the finishing touches to the whole project and his continued success in the music business world, albeit a children’s one with lots of fun.